SAILING DVDS OF CATAMARANS VOYAGING AROUND THE WORLD. CAPTAIN DAVE. DON'T LISTEN TO THE VOICE OF NEGATIVITY. LISTEN TO THE SOUND OF YOUR DREAMS! You are never safe from negation. Unchecked negativity can rapidly flush the achievements of a lifetime down the drain. Negativity is an ever present and unwanted companion that continually invites you to abandon your dreams. Everyone moving in the direction of their dreams will suffer defeats and sometimes feel their dreams are impossible. Negativity will attempt to derail them on the path of achievement, and the temptation to quit will be strong. Everyone wants life to be easy. They want either no opposition at all or opposition to politely step out of the way as they move toward their goals. This is unrealistic. People who achieve their dreams aren’t strolling through life; they are climbing the mountain of difficulty, and hard work and perseverance are the only way to reach the top. 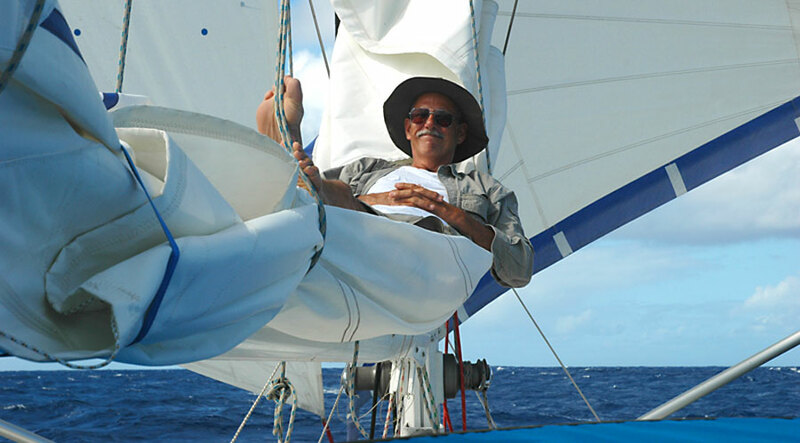 When you decide to sail around the world on a sailboat, you encounter an ocean of opposition. A crowd of naysayers and critics freely offer unsolicited opinions and advice concerning your proposed circumnavigation of the globe. Friends are sure you are having a midlife crisis. When you write the check to pay for your yacht, they inform you that you have made a down payment on an expensive funeral at sea. They tell you all of that money could have been spent on a nice house, 100 channels of cable television, and the help of a good therapist to get you over this foolish desire to sail around the world. The easiest thing to find on planet earth is someone to tell you why your dreams are too expensive, too dangerous, and a waste of time. With cheerleaders like that, it’s amazing anyone pursues their dreams. Once I hoisted my sails in Fort Lauderdale and started my voyage, I had dozens of opportunities for negativity to sink the ship of my dreams. On my first night at sea, I experienced the most powerful thunderstorm I encountered on the entire trip around the world. Surely, that must have been a sign sailing around the world is a bad idea. It was a message to stop the voyage in the Bahamas, anchor the boat in Chicken Town, and check in to Hotel California where I could never leave, but at least I would be safe. Negativity is a dream stealer. Don't listen to the voice of negativity. Instead, listen to the sound of your dreams. Click on this button to tell your friends about Listen To The Sound Of Your Dreams. Clouds are a sailor's friend. As long as there are clouds in the sky, you have a good idea about the type of sailing conditions you will experience for the next couple of hours. They won't necessarily tell you what's going to happen tomorrow or the day after, but if if you listen to what they say, it's not too hard to stay out of harms way when you are sailing offshore. Clouds start at the sea surface extending up to eighteen-thousand feet, and when you look at them, you can figure out what's happening to the wind at different altitudes. High cirrus clouds tell you what's going on in the upper levels, and trade wind cumuli tell you what's happening at the lower levels. When you look at their speed and direction of movement, you discover what the winds are doing at your location. Clouds aren't static. Their size and shape continually change throughout the day. Trade wind cumuli increase in size and height until late in the day. As the sun sets you can watch them shrink as they literally melt away in front of your eyes. Thunderstorms announce their presence as vertically developed cumulus clouds that go all the way to eighteen-thousand feet, and they usually do it long before lightning and thunder make their appearance. When clouds are taller than they are wide, you have a condition called vertical development. When you are sailing offshore, you always look to see how much vertical development there is in the cumulus clouds, because you know it's highly unlikely to have thunder and lightning with associated squalls unless there is significant vertical development. It's easy to avoid thunderstorms and squalls, because you can see them forming and alter your course to avoid them. There's no need to be pummeled by fierce downdrafts of forty to sixty knots; you simply sail away from them or around them. I usually don't get caught by squalls and thunderstorms unless I am not paying attention to the clouds, or if I am at anchor, and there's nothing I can do to avoid them because I am stationary. Paying attention to clouds isn't rocket science, and you don't need an advanced degree in meteorology to use clouds to your benefit. You simply need to pay attention to what is going on around you. In thirty-three thousand miles of sailing I have been in squalls quite a few times, and I can't remember a single instance in which I was caught off guard with too much sail up because I pay attention to what the clouds are saying. I am careful to not be over-canvassed, because blowing out sails and loosing a mast in high winds is expensive and dangerous. I sail in damage control mode most of the time, and that means fear is not a member of our crew. 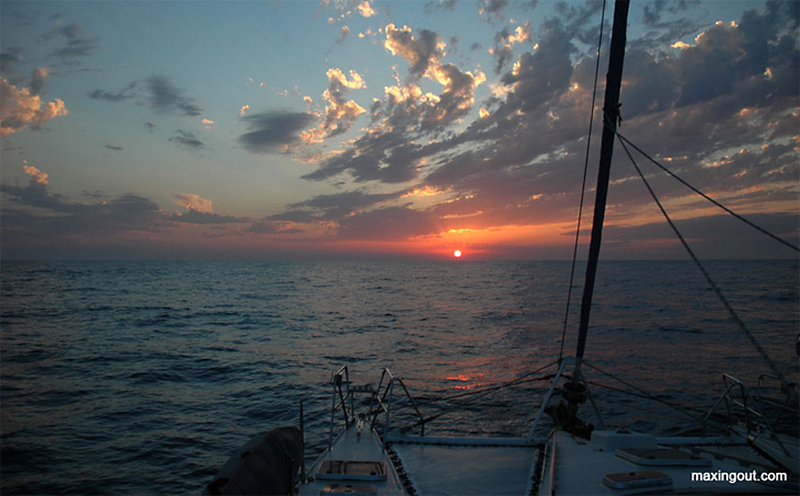 The sailing photo at the top of the page shows Exit Only confidently motor-sailing into the sunset. The low level cumulus clouds are breaking up as the sun sets over the horizon. Those clouds tell me it's going to be a quiet night at sea, and I feel good. 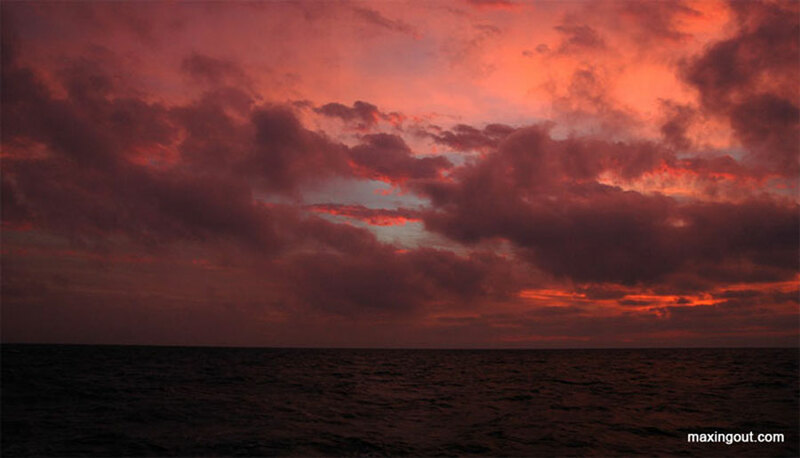 This photo is a fully developed example of "red sky at night, sailor's delight." A red sky in the evening usually means the weather is going to be relatively benign during the night. It will be a "no worries mate evening," and that's reassuring because there are lots of clouds in the sky. Even when the sky looks ugly with billowing cumulonimbus clouds on the horizon and black squalls heading your way, you have plenty of time to prepare for the onslaught. Thunderstorms don't last forever, and squalls pass quickly by. If you listen to what the clouds are saying, you will handle these meteorological inconveniences in stride. You will reduce your sail to a safe level until the tempest is over. The real problem isn't the wind and waves. It's the storm of thoughts blowing though your mind that gets you into trouble. If you listen to the voice of fear, your sailing adventure becomes a nightmare. But if you listen to the clouds, you will recognize the voice of fear for the imposter that it is. 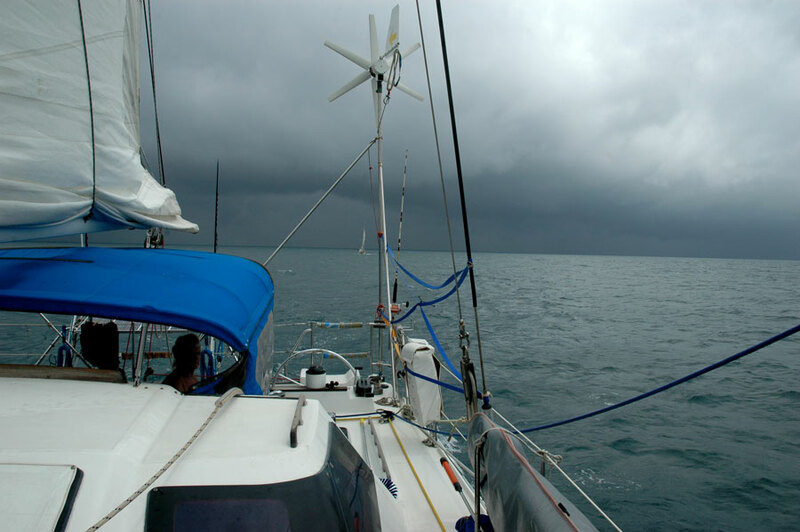 People who sail offshore in a well-found yacht have little to fear from the weather ninety-eight percent of the time, and the clouds usually tell you what to do. The clouds are your friends, and if you listen to what they say, your life will be good as you sail on the ocean of your dreams. TAKE THE PLUNGE AND ORDER THE RED SEA CHRONICLES. JUMP INTO A GREAT SAILING AND CRUISING DVD. YOU WILL BE GLAD THAT YOU DID!